When Lara first set eyes on her new doll, an unforseen level of calm descended over her. Instead of rushing to rip open the box, Lara asked me very politely, "Mummy, can I play with her?" and it left me almost speechless! Since then, I've really noticed that when Lara is playing with her Corolle doll, that she is much more well behaved than normal. Very weird, but very welcome. 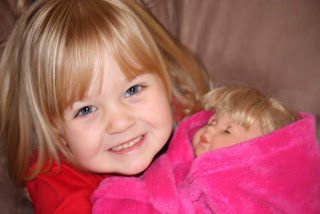 Lara named her doll Rosie after one of her best friends at nursery. Rosie is very much part of the family now. Lara likes to change her nappy (clearly, although Rosie is a toddler, she isn't yet potty trained!?!) and brush her hair with the brush that came with the doll. Lara also enjoys "styling" Rosie's hair. I say this in the loosest sense of the word... it normally involves clips and hairbands shoved in at all angles in a wild mess. Lara has obviously inherited my own hair styling skills. The Corolle Chouquette Blonde doll currently costs £54.99. She has a soft fabric body that makes her flexible and comfy to carry but has shaped vinyl limbs which are ever so slightly scented to make her seem like she has that 'baby' smell. Rosie can sit unaided when Lara wants to style her hair. Rosie the doll is small enough to fit into Lara's toy pram. Lara has clearly taken to Rosie very well because she has the great honour of being allowed to spend the night in Lara's bed - something previously reserved for her two favourite cuddly toys only.